Another busy lady behind the scenes! Mags began to make miniature food when, with a couple of other members, she started the Watford Miniaturist Club, in Watford, Hertfordshire. Mags served as Chair for several years until taking early retirement and moving to Northamptonshire. Mags and husband Dave now have much more time to spend producing quality miniature food, filled furniture, printables and many other dolls house accessories. The most popular periods are Tudor and WW2 and these are their ‘speciality’ ranges. Also available: Georgian, Victorian, 1950s and Modern items. 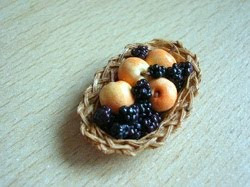 A new range of 1/24th scale food is being produced for Spring 2008. Mags writes regularly for Dolls House magazines, runs workshops and gives talks at W.I and other meetings. Mags Cassidy of Mags-nificent Miniatures is proud to announce the launch of her new range of 1:24th scale food. 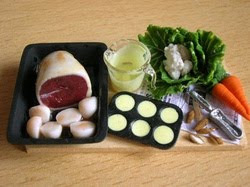 The range features a wide range of food items, together with highly original preparation boards. I love your roast! Ah! It is so cute!I also am in love with your texture in the carrots! WOW!